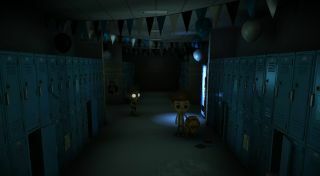 Ian’s Eyes is an upcoming survival horror game that sees you fill the paws of North—a guide dog tasked with steering the titular eight year-old Ian around his first day at Blue Norholm Centenary School. It’s been a while since I left school, far less started it, but I imagine this would be a pretty intimidating experience at the best of times, Things get decidedly worse, though, when North discovers all is not well in the backwater town of Wintreal. You see, it seems Blue Norholm is haunted. Not the best of starts, then. That last part sounds like an interesting conceit, and sort-of sounds like a more sophisticated—or sensible, perhaps—take on Amnesia’s panic mechanic. What’s more, the game’s quirky, Burton-esque aesthetics, and the fact that Ian’s zombie classmates remind me of Kevin from the first Sin City, make me suddenly realise I’m not sure if I really want to play Ian’s Eyes when it launches this summer on Steam. I probably will though, because I’m a glutton for horror games. But, um, you first. I’m right behind you, I swear. In the meantime, why not check out Ian’s Eyes’ free demo?